Forest Thomer didn't assault a physically disabled person. He didn't even verbally heckle her. Nonetheless, Cincinnati police charged Thomer with disorderly conduct after he used the word "crippled" to promote a comedian with muscular dystrophy. 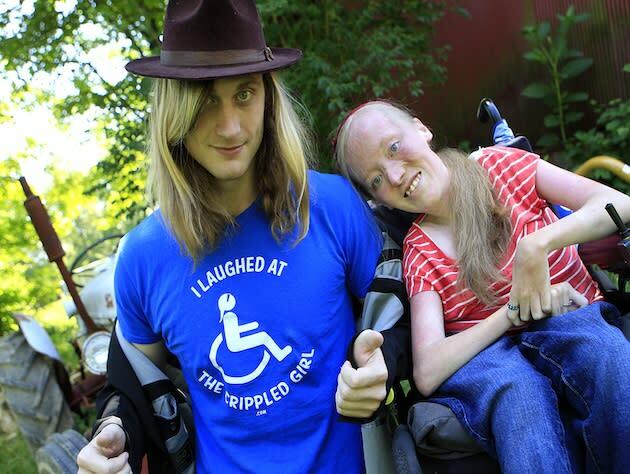 But perhaps most shocking of all, the AP reports that comedian Ally Bruener is actually Thomer's friend and even instructed him to ask the crowd if they wanted to "laugh at the crippled girl." And now both are saying the Cincinnati police violated his free speech rights by issuing the charge. "You can't just arrest people or have them arrested just because you don't like what they are saying," Thomer said. "I don't think words have power until you react negatively to them," Bruener, 23, added. "People are trying to be too politically correct and force us to be as well." Nonetheless, police say Thomer, 25, disrupted visitors to a "Party in the Park" event in downtown Cincinnati by walking up to them and shouting obscenities. According to the complaint filed in Hamilton County Municipal Court, Thomer was asked to stop but, but "persisted in yelling and shouting, causing annoyance and alarm to others." Thomer is scheduled to appear in a Cincinnati courtroom on Wednesday and could face up to 30 days in jail if convicted. Reportedly, police declined to arrest Thomer when he informed them that he was Bruener's only ride home from the event. Still, even if Thomer was exercising his right to free speech, he may have violated one of the park's other rules by attempting to record reactions from the crowd to use on Bruener's website, I Laughed At The Crippled Girl. "We don't allow anyone to conduct marketing at our events without prior authorization or take video of our guests for commercial purposes without their approval," Cincinnati USA Regional Chamber spokesman Chris Kemper said.